How did a dissertation on popular nineteenth-century sensation novels lead to a career as director of the Duke Digital Humanities Initiative and co-founder of Duke’s new, interdisciplinary PhD program in Computational Media, Arts, and Cultures? Victoria Szabo (PhD 2000) suggests that the diverse strands of her professional life might be unified under a single motto: keep doing what you love, because the interests you’ve pursued just for fun might very well become your next job. Szabo explains that in tracking down out-of-print Victorian novels for her dissertation – and spending long hours in the microfilm room – she became increasingly intrigued by questions of textual accessibility, preservation, and canon-formation. At the same time, while working in the Robbins Library under its then-director (now Director Emeritus) Alan Lupack, Szabo was charged with investigating a new tool for creating webpages – HTML – and to explore its possible applications in the Library. It soon became clear that rare or little-known texts and images could be made available to the public on an unprecedented scale: the result was the founding of The Camelot Project, an interactive online database of Arthuriana drawn from both the Robbins Library’s rich resources and Lupack’s own personal collection. The first web editions of the TEAMS Middle English Texts series, published under the direction of Professor Russell Peck, soon followed. (Szabo also created the English Department’s first website.) These early forays into HTML, meanwhile, prompted Szabo to think more theoretically about the effects of joining texts to visual media – an interest she was able to foster by taking an additional year of coursework in the Visual and Cultural Studies program. With her expertise in humanities computing, Szabo found positions as an Instructional Multimedia and Technology specialist at Grinnell College, and later as an Academic Technology Specialist at Stanford University. But she still maintained her other passions: teaching was one of them (and after asking if she could offer courses incorporating academic technologies, she was in fact granted the title of “lecturer” as well); another was her scholarly interest not just in media but in media studies, a field that she continued to follow. Both pursuits were to become central to her next job, as the Administrative Director for the Information Science Studies Program at Duke University – the mission of which is to study and create new information technologies across disciplines. As her work evolved further, she was appointed Assistant and then Associate Research Professor of Visual and Media Studies, also at Duke. 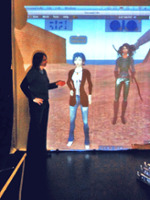 In addition to teaching courses in media and information studies, Szabo now collaborates on digital mapping, visualization, augmented reality, and database projects focused on cultural heritage; she also publishes articles in digital-humanities topics, curates digital-art exhibitions, and co-creates game-based installation art. She looks forward to her next task – overseeing the development of the innovative doctoral program that she has helped to inaugurate, and training a new generation of students to bridge disciplines and break down boundaries just as she has been doing for nearly twenty years. Excerpts from a May, 2016 interview with Szabo appear below. How did you select the U of R’s English PhD program? I knew I was interested in Romanticism and Victorian Studies, and in the connections between the gothic and later forms of Victorian romanticism, including sensationalism. The U of R’s Department had strengths in both of these areas, and seemed to welcome research that crossed disciplinary boundaries. After having attended Williams College as an undergraduate, and then Indiana University, Bloomington for an MA, I also knew I wanted to return to a smaller setting, where there would be a strong sense of community and also a lot of flexibility: I wanted to take courses in other departments and programs such as Visual and Cultural Studies, and also Gender and Women’s Studies, where I earned a Graduate Certificate. More simply, I valued the opportunities that a smaller program affords for learning from faculty and fellow students not technically in one’s area of specialization, such as medieval literature. And the faculty seemed really to care about the students and how they developed their own trajectories for research and teaching. In addition to giving you the academic and professional training you needed to launch your career, how do you feel that your time at the U of R has continued to benefit you and your work? I have continued to benefit from my U of R relationships through connections with faculty advisors and fellow students. Although I’m now in a department of Art, Art History & Visual Studies, I still feel like my work and interests still fit well into the UR English Department’s inclusive approach to the study of literature, language, and creative expression of various kinds. As a Rochester grad I am part of a larger intellectual community that I reconnect with at the Modern Language Association conferences and other events, including those at the U of R. Several years ago I participated in an English graduate student reunion where leading digital humanities scholar N. Katherine Hayles – another Rochester alum, and my senior colleague at Duke – returned to give the keynote. Back in 2010 I also gladly came back to Rochester to give a talk in honor of the 20th anniversary of VCS. And while I was helping to develop the Visual Studies Initiative at Duke, as well as our new interdisciplinary PhD program, another senior colleague in my department commented more than once on my “Rochester School” orientation towards the study of texts and other media through historical, post-colonial, and cultural-studies lenses. I consider that a great compliment! On another note, I should mention that I have always felt supported by my UR mentors – Bette London, Morris Eaves, Alan Lupack, Russell Peck, and David Bleich, among others – and have received valuable advice from them over the years as I have navigated my somewhat unusual career path. What advice would you offer to prospective or current PhD students in the humanities? This is a complex topic, especially in an environment where the nature and structure of higher education itself is in flux: indeed, it is not unusual to encounter the language of crisis in relation to our disciplines. But I would say that the humanities are more important than ever, and that our critical and creative work remains essential to the wider culture, regardless of where we end up professionally. Even more so in a world that is increasingly technology-mediated, filtered, super-saturated, and global. And behind all the multi-modality, text is still king in terms of code, metadata, semantic webs of associations. Right now at Duke I’m helping to expand programs that provide graduate students experience with project management and mentoring, as well as with collaborative team-based research methods, and with creating public-facing projects. All of this is part of a new NEH Implementation Grant. These are also all things I was able to do at Rochester twenty years ago – and I know that those opportunities exist here [at Rochester] even more now. Relatedly, I would also suggest that while students certainly need to work steadily on their coursework, exams, and dissertation, it can also be helpful to develop one’s “side” interests, whether in another academic sub-specialty, foreign languages, digital technologies, publishing, or others. We often talk about alt-ac (alternate academic) careers as though they were separate from academia, but there are so many jobs within the academy that aren’t what you think of as traditional professor jobs – whether in libraries, humanities centers, digital-project labs, university presses, etc. They can be quite intellectually engaging, challenging, and meaningful – and in some ways with more visible impact. There also doesn’t have to be a sharp bifurcation between preparing as though you were headed towards a tenure-track assistant professorship versus another type of position. Both – and. You never know. As it was for me, your side project or interest could become central to your next major role or project.